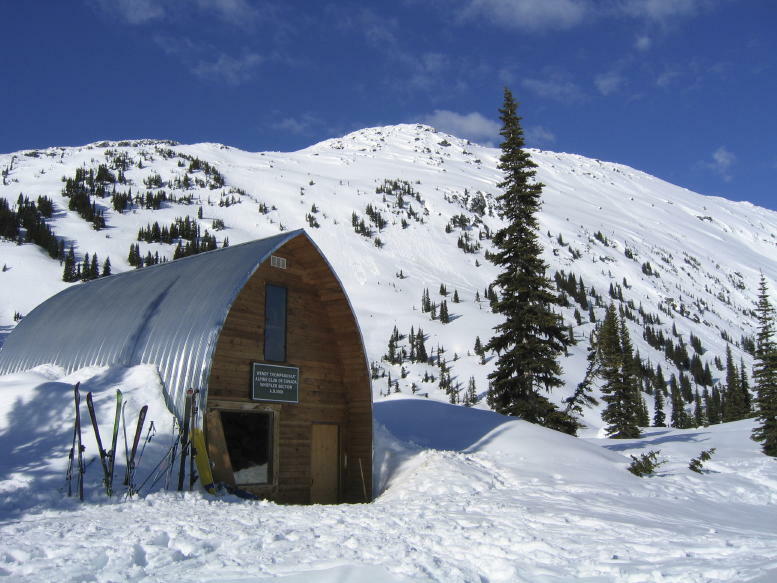 The Wendy Thompson Hut is a basic ski touring hut in the Marriot Basin area off the Duffey Lake Road just north or Whistler and Pemberton, in honour of Wendy Thompson, a keen local hiker who was killed on a BCAS Infant Transport flight enroute to the Queen Charlottes in 1995. It is operated by ACC Whistler. It is approximately a 1 hour drive from Whistler to the trailhead, then a 2 – 3 hour hike or ski in. This location provides extensive ski-touring opportunities and there are also a number of peaks in the vicinity. The hut is a two-storey gothic arch design that accommodates 16 people in the upper sleeping loft. The new nightly rate is $15/night for members of the ACC Whistler or ACC Vancouver Sections and $20/night for others. There is a new online reservation system. Wood stove for heat. New solar lighting. Cooking stove has been removed due to negligence, so bring your own cooking stove.